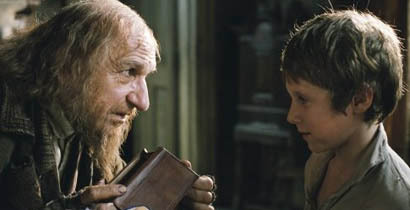 A humanistic Fagin (Ben Kingsley) tutors a winsome Oliver (Barney Clark) in crime in 2005 flim. Roman Polanski's take on Oliver Twist in 2005 is in some ways an expansion on Lean's 1948 film—and in other ways a contraction of that film. This film runs an extra fourteen minutes but it fits additional subplots and nuances into the main, middle part of the story only by excising huge chunks at both ends. It is somewhat unnerving for a viewer familiar with the Oliver story to be initially thrown into the tale when the boy is already eight years old at the orphanage, just in time for the dinner scene. And over two hours later it can be a letdown to have the film end suddenly with Oliver heading home with Mr. Brownlow, minus any relation between them apart from that of a waif and a benefactor. The elements of the narrative concerning Oliver's birth, his inheritance, and the scheme to defraud him all go missing. But it has to be said, this works very, very well. Polanski and writer Ronald Harwood have created a conventional version of Oliver Twist that nonetheless updates it for modern sensibilities. All that stuff about the poor kid secretly being entitled to affluence was a staple of sentimental Victorian fiction. And somehow the morality tale plays better today when Mr. Brownlow is seen as acting out of sympathy for a deserving youth, rather than out of some convoluted familial and personal obligations. Barney Clark is the latest in a long line of winsome Olivers. He's blond, pale, thin enough to suggest malnutrition, and going on twelve—perhaps slightly older than required, which is a nice switch from previous Olivers who tended to be too young. Cedric Hardwicke (best known on TV as Dr. Watson to Jeremy Brett's Sherlock Holmes) is a compassionate Mr. Brownlow, striking the right note of liberal concern for this Twist. But the heart of this Oliver Twist, as for most others before, is the old fence Fagin and his young gang of pickpockets. Ben Kingsley may be the greatest actor to have played Fagin. He takes Guinness's portrayal and turns it up a humanistic notch or two. For the essence of the Oliver story, this Twist is, well, essential viewing.